Disney’s Raw Toonage is a half-hour Disney animated cartoon series that aired on the CBS network in the fall of 1992. The idea for the show had an unusual genesis. Disney TV was developing a 65-half hour series for their Disney Afternoon block entitled He’s Bonkers D. Bobcat. The premise was similar to Who Framed Roger Rabbit in that the series dealt with the lead character’s adventures post-stardom. The actual production of this series was troubled, in large part because the so-called real characters in the series were also animated, only not as broadly as Bonkers and friends. 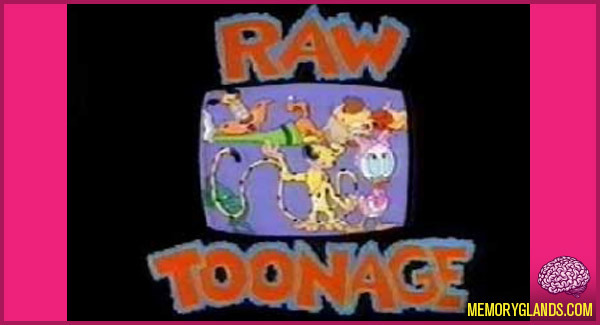 Due to the shorter production schedule, Raw Toonage, with its Bonkers shorts, was on the air before the 65-half hour show, thus adding some credibility to the back story.